Enjoy your journey in air-conditioned comfort, with free WiFi and a fully-stocked bar. 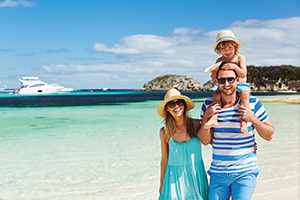 The ferry runs daily departures between Fremantle and Rottnest Island, view the ferry timetable and book here. Check out Sealink Rottnest's tour packages, featuring electric biking, skydiving, joy-flights and whale watching. Delve into Rottnest's history on a guided tour through Rottnest's tunnels or simply explore the island at your leisure with a hop on/hop off bus.